As the capital of Yunnan, Kunming is known as the City of Perpetual Spring for its pleasant all-year-round spring climate. The city is one of the most popular tourist destinations in China. Kunming has a history spanning more than 2,400 years and features numerous must-see attractions such as Dianchi Lake and Yunnan Ethnic Village. The wide variety of its historical and natural beauty makes it one of the top 10 most popular tourist cities in China. The city has a large ethnic minority population, giving it a varied and rather exotic minority culture. Kunming is also noted for its many local delicacies, including "Across the Bridge Rice Noodles (Guoqiao Mixian)." 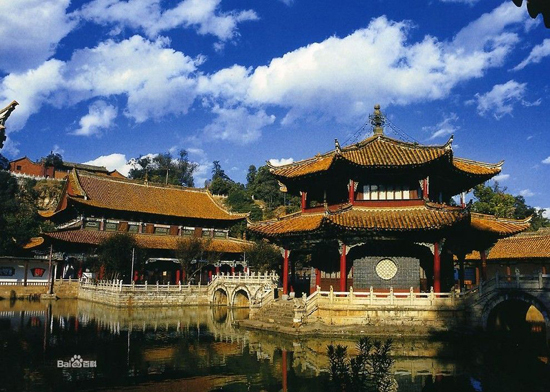 China.org.cn here present you with its top 10 attractions in Kunming, China. Yuantong Mountain, located in the northeast corner of Kunming, is a popular urban park which draws in a large number of tourists every year. Covering an area of 26 hectares, the mountain is long and narrow. The most well-known features of the mountain are its cherry blossoms, animals and the ancient temple. Cherry trees in Kunming bloom earlier every spring than those in Japan, due to its warm weather and low latitude. Strolling around in this "sea of flowers" is a very romantic experience for visitors. The mountain also boasts a zoo, which is home to 500 varieties of animals, including elephants, tigers, peacocks, pandas, red-crowned cranes, giraffes, African zebras and Australian kangaroos. Sitting at the foot of the mountain, the Yuantong Temple is the largest and one of the oldest Buddhist temples in the city. In addition to its magnificent architecture, the temple is also famous for its beautiful gardens and tasty vegetarian dishes.